Mordian 7th Regiment: Heresy Era World Eaters - Ready for Adepticon! Coming in just under the wire, Kharn and the 8th Company are ready to deploy to the battlefields of the Schaumburg Sector! Packed the army up and schlepped it over to the local GW shop for a family photo, and am quite happy with how the force turned out. Pretty infantry heavy, but you can't lop off limbs and take skulls without a whole mess of dudes toting chainaxes, now can you? In other news, I've been beavering away on a display/carry board for the event. 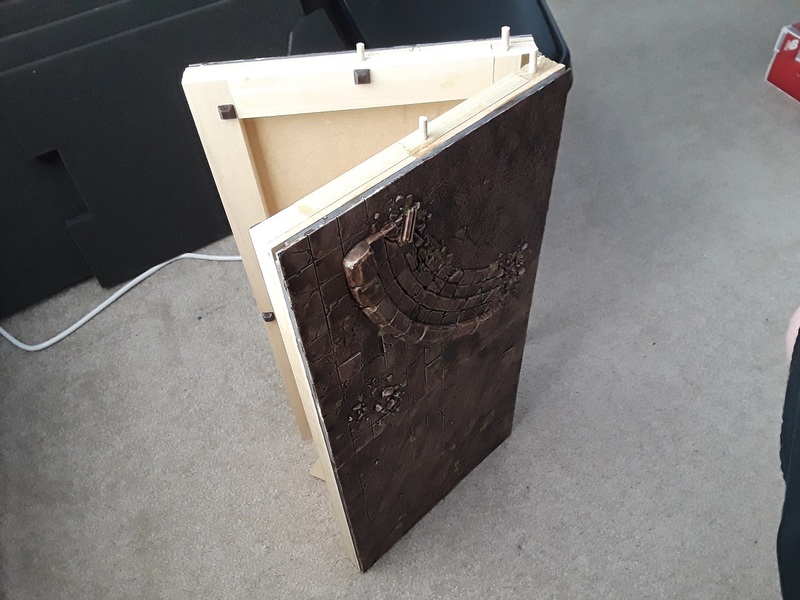 In years past I've been dinged on painting scores because I didn't have a display board, so it was time to recify the situation! 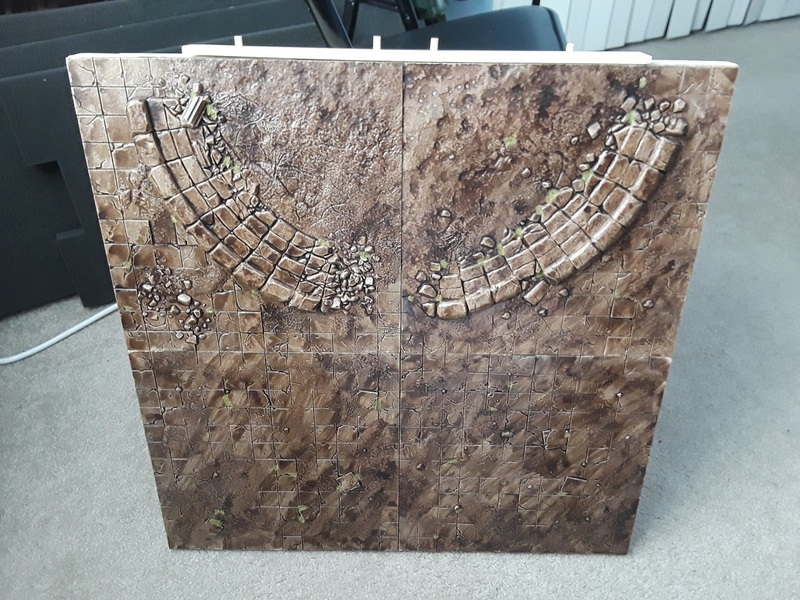 I'd picked up a set of terrain tiles from Secret Weapon Miniatures but found that, while they looked cool, on their own they just weren't structurally sound enough to carry the models from place to place (they're very much just table-toppers). 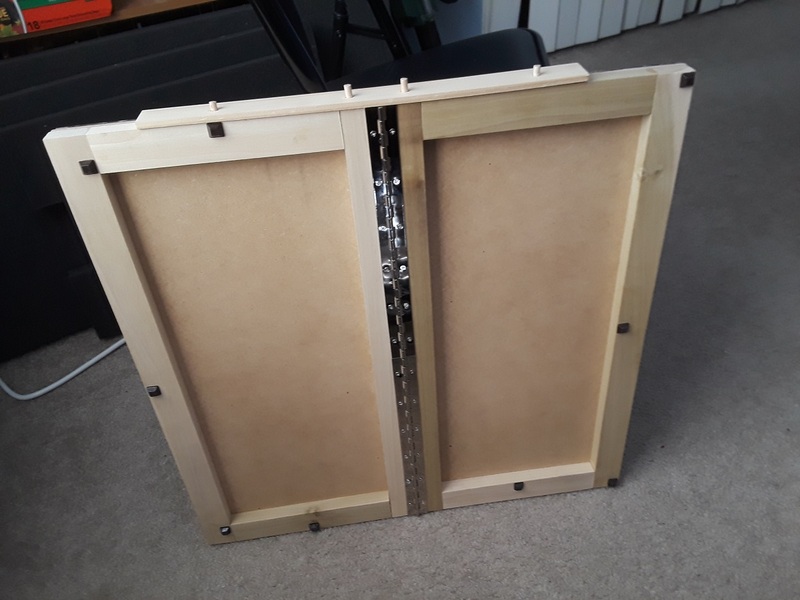 Got a buddy of mine who's got the woodworking tools and talents to build me a little hinged frame setup for 'em, and it's going to work a treat! Ended up adding a little of my own ham-fisted woodworking to create a brace to lock it in an open position with a couple dowel rods and a strip of wood, as I was worried a little bit about it accidentally folding up while moving it about. It's solid as a rock with that addition, and I'm really quite pleased with the end result! 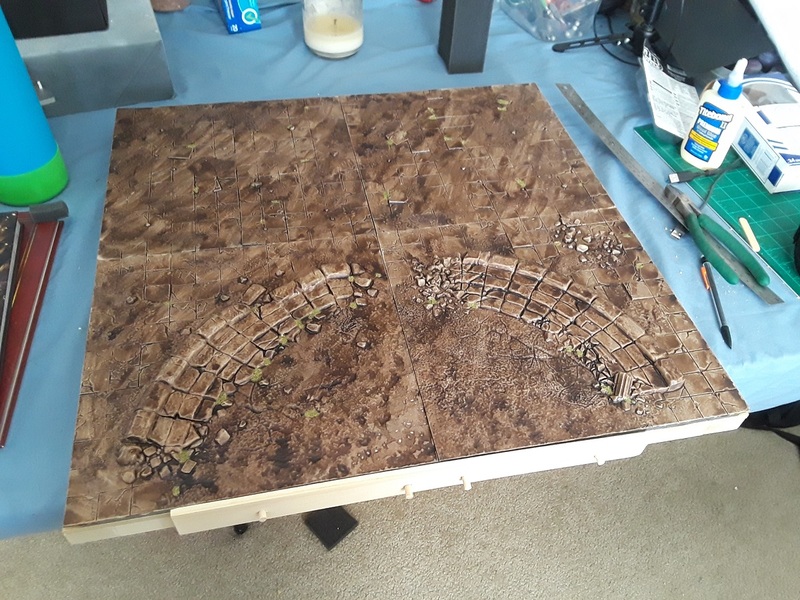 I'm scheming on trying to add a little three-dimensionality to it with some magnetized buildings, but I'm not sure I'll be able to pull it off in time for the show. If not, it'll have to do as is - We'll see how it goes! Thanks! Aye, looking at some options but not sure if I'll have time to bring them to fruition before it's time to head to the con. It all looks brilliant mate. Top stuff! 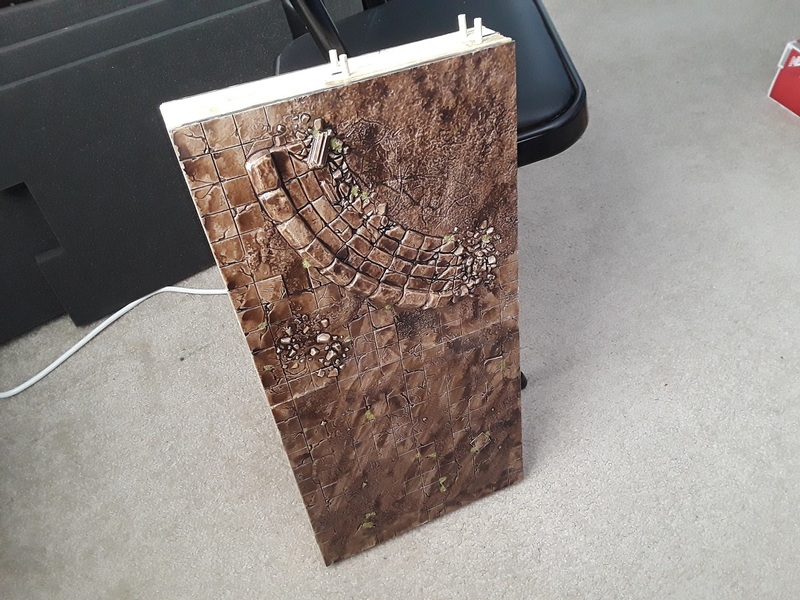 Army looks incredible and brilliant idea with the display board! Cheers! Really looking forward to the events! 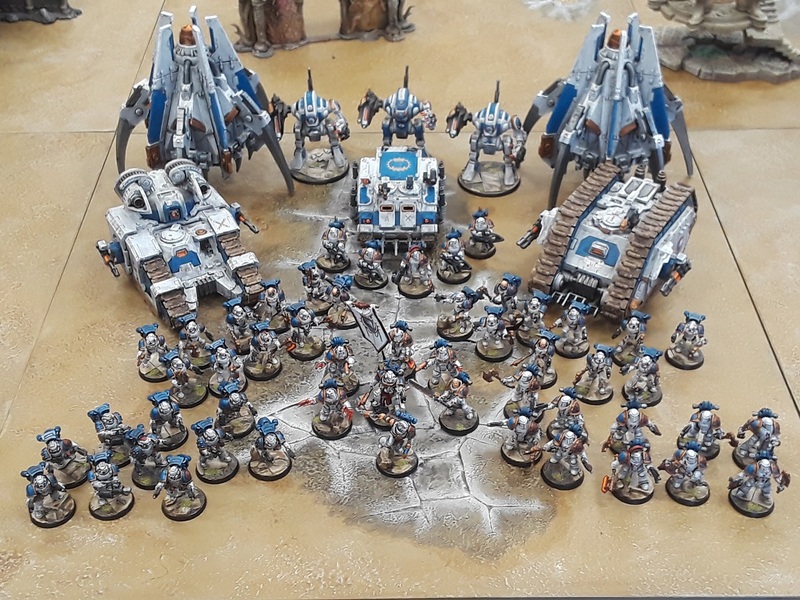 That's one tidy looking army, great work! Looking great all together like that! That is an excellent folding frame on the display board, too. Always nice to get a good family photo! Cheers! Wow army is looking fab! But no pic of the pretty army on the equally pretty display board??? Hah! Timing was wrong, was still gluing up the display when the army shots were taken. Will get a good one out at Adepticon, though! Thank you very much, man! 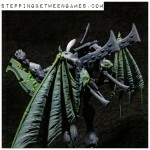 I really enjoyed building and painting them, and they may end up being my "keeper" army for the foreseeable future!